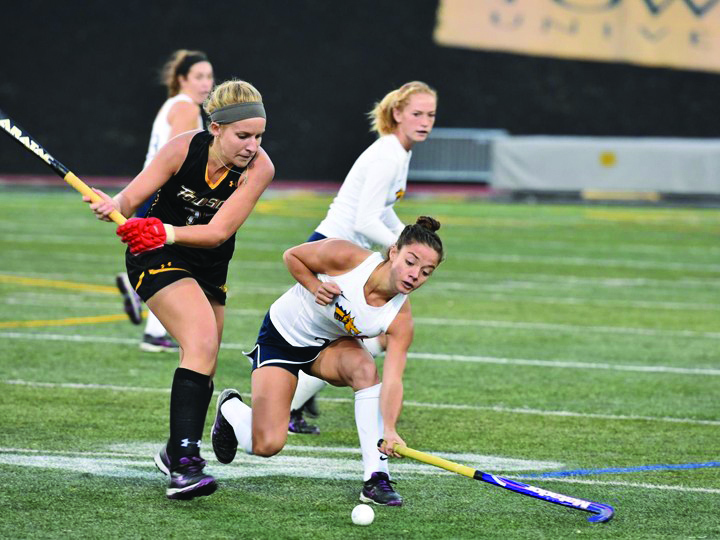 The Drexel University field hockey team played its last two games of the 2016 regular season this past weekend when it faced the Towson University Tigers Oct. 28 and University of Delaware Blue Hens Oct. 30. Although both games varied in terms of difficulty, the Dragons needed to play at their best to win especially against a tough team like Delaware. Towson was the first matchup of the weekend for the Dragons. The Tigers came into the matchup struggling with a record of 2-15, while the Dragons entered with a modest 7-9 record. This was a possible trap game for the Dragons and they couldn’t overlook the strength of the Tigers’ squad. . The Dragons came out playing tough defense and limited Towson to just one shot on goal the entire first half. On the other hand, the Dragons had multiple shots on goal but could not execute. It was an exciting half for Drexel fans to see the offense have a plethora of scoring opportunities, but unfortunately the Dragons could not reach net. The second half was a bit different as Drexel came out of the gates firing. Sophomore Megan Wiest scored the first goal of the game for either side. She was assisted by a nice pass from the senior Idrienne Walker. About two minutes later the Dragons were back on the offensive. Megan Wiest again scored, this time taking advantage of a nice assist from junior Alison McCardell, and pushed Drexel’s lead to 2-0. The Dragons scored once more off of the stick of freshman Tess Bernheimer, making the game 3-0. Bernheimer’s goal helped her win the Colonial Athletic Association Player of the Week. The Tigers scored shortly after, but that was their only score of the game. Drexel took the win by a score of 3-1 then moved on to face Delaware. Delaware was ranked ninth in the nation, so the Dragons were going to have to bring their A-game in this matchup. The Blue Hens came out firing by taking five shots within the first 12 minutes of the game. Sophomore Erin Gilchrist did an excellent job in goal. Each of the first five Blue Hen shots required her to make a save, and five saves is what she made. Gilchrist’s play was instrumental in preventing the Blue Hens from gaining early momentum. Delaware continued to attack the goal, but Gilchrist made two more big saves in the middle of the half. Finally, however, Delaware scored the first goal of the game to make the score 1-0. About five minutes later, they scored again to put the score up to 2-0. The Dragons unfortunately could not keep the ball on the Delaware side of the field and could not muster up a single shot on goal in the first half. The second half was much of the same. Delaware was relentless in their attack, taking shot after shot. Erin Gilchrist continued to make saves to try and keep the Dragons in the game. With about 10 minutes left in the half the Blue Hens scored again to push their lead to 3-0. The Dragons quickly retaliated with a goal of their own, but that was the only goal the Dragons managed. With one last goal scored by Delaware, the result was decided, a 4-1 victory for the Blue Hens. The Dragons were outshot by the Blue Hens 22 to 2. The loss dropped the Dragons to 8-10 on the season and 3-3 in CAA games. Drexel will face Delaware again in the conference semifinals this Friday, Nov. 4. Look for the Dragons to work on both stopping the Delaware attack and intensifying their offensive attack. The Dragons played well against Delaware, and if they can game plan effectively, an upset is definitely on the table.